Daniel Craig and Léa Seydoux as James Bond and Dr. Madeleine Swann, respectively, in Spectre (2015). The 00-7th of September means BAMF Style’s first post on Spectre, the 24th and most recent entry into the cinematic James Bond canon. As this was the most requested Spectre content by far, I’ve allowed popular demand to dictate the brown Brunello Cucinelli jacket and trousers that Bond wears in Morocco to be the focus of this inaugural post. 007 spends much of Spectre traversing Europe in search of the shadowy figurehead from his past that now leads the terrorist organization Spectre. With the companionship of Dr. Madeleine Swann (Léa Seydoux), Bond tracks the elusive Franz Oberhauser to a remote part of Morocco and allows himself to fall into the hands of his old nemesis. It’s a nice touch of verisimilitude to see even James Bond, arguably the most well-outfitted man in the world, mixing elements of his casual and formal attire to fit his surroundings. While traveling through Morocco in Spectre, Bond makes good use of a pair of Brunello Cucinelli khaki chinos and J. Crew suede boots, wearing them both casually with a Matchless suede blouson jacket and more formally with a linen jacket and tie. This outfit incorporates brands favored by both James Bond and Daniel Craig. While 007 has been sporting Tom Ford on screen since Quantum of Solace in 2008, Spectre marks the first known clothing from Brunello Cucinelli, a brand that the actor has been known to wear in real life. Bond wears Brunello Cucinelli jacket, trousers, and belt with a Tom Ford shirt and tie while he and Madeleine wait for Blofeld’s driver to pick them up. Bond is able to wait patiently in the heat by dressing comfortably in a lightweight linen blend jacket. Bond wears a light brown single-breasted Brunello Cucinelli jacket that Bond sartorial blogger Matt Spaiser has identified as “a blend of 51% wool, 41% linen and 8% silk” on his blog, The Suits of James Bond. Unlike many of Bond’s tailored jackets, there is very little in the way of structure of padding, sacrificing formality for comfort in the warm desert climate. It also is Bond’s only Spectre jacket cut with double vents, allowing more air to pass through and also giving 007 a better opportunity to reach for his holstered Walther PPK if the need arises. The jacket has a three-button front, although the top button is often rolled over by the lapels. The lapels are very unorthodox from the notches themselves to the buttonhole. While buttonholes are mostly decorative or used strictly for carnations, this jacket’s keyhole-cut buttonhole is actually functional as evident by the small button under the right side of the collar. The top of each lapel notch slightly flairs out like a cran necker or “fishmouth” lapel. Bond’s Brunello Cucinelli jacket features a functioning buttonhole on the left lapel for the small button under the right collar. Very close edge-stitching is visible on the lapels, pocket flaps, and around the un-roped sleeveheads. The jacket has a welted breast pocket and flapped hip pockets that both slant slightly toward the back. As the jacket flaps around in the desert wind, the quarter lining and the tan-jetted inside breast pockets are also seen. There are four buttons at the end of each cuff. Bond greets his new host captor with a mutual decorum that hasn’t been seen to such a polite degree since Dr. No. In addition to the aforementioned entry on The Suits of James Bond, more information about this jacket and outfit can also be found at James Bond Lifestyle, which provides Brunello Cucinelli’s product number for the jacket (MH4157BR6 C1011) and the trousers (M067DF1050 C1581). Bond’s Brunello Cucinelli khaki chinos are only slightly lighter than the brown jacket, perhaps not enough of a contrast to justify wearing both together; a stone gray pair of trousers may have been a wiser option. These flat front, low rise trousers are constructed from aged 100% cotton gabardine. They have six belt loops around the waist and a pointed-tab that extends over the top of the fly to close on a single button. Through the loops, he also wears a Brunello Cucinelli brown woven leather belt, which James Bond Lifestyle identified as product number MAUIB324 C4001. Unlike some fully-braided leather belts, this one has a solid tab with holes for the polished gold buckle’s single prong. Bond looks pretty smug for a guy who’s walking (or riding) straight into a trap set by the world’s most devious megalomaniac. The trousers have slightly slanted side pockets and button-through jetted back pockets. They have a very slim, straight leg fit down to the plain-hemmed bottoms, which are worn rolled-up – not professionally cuffed, mind you. These are the same trousers he wore earlier with the Matchless suede blouson jacket. While the decision to roll up his bottoms may look silly, this appears to be more of a Brunello Cucinelli style as many trousers from the brand’s current site lineup appear to have rolled bottoms, including these cotton gabardine slim fit trousers that appear to be the spiritual successor to the Aged Gabardine Chinos worn by Craig in Spectre. Spectre continued the Tom Ford relationship that began during Daniel Craig’s tenure as Bond in Quantum of Solace, although this is one of the few on-screen outfits that does not include a Tom Ford tailored suit or jacket; the only Tom Ford reflected in this outfit is the shirt and tie. Bond wears a white cotton poplin shirt with a point collar, narrow front placket, and 2-button turnback or “cocktail” cuffs. Tom Ford calls these the “Dr. No cuff” in homage to the same rounded cocktail cuffs that Sean Connery wore in his first outings as 007. 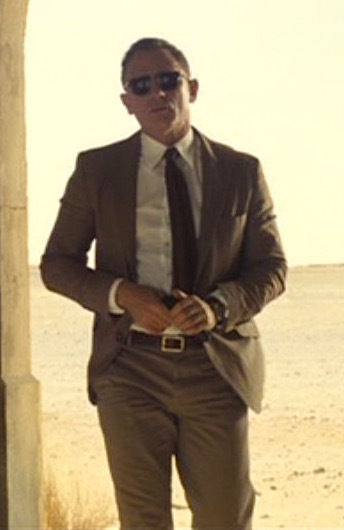 Bond’s Tom Ford shirt gets plenty of screen time in the Moroccan desert when the heat forces him to take off his jacket or when the strong winds blow his jacket and tie around. Bond’s Tom Ford tie is a brown silk knit with a wide, pointed tip that ends a few inches above the waistband of his low-rise trousers. Many 007 fans are having a surprisingly hard time finding a similar tie to the one Craig wore on screen, as discussed at the ajb007.co.uk forums. The knit tie nicely follows the informality of the outfit while still keeping it classy. Bond wears a pair of tan J. Crew “Kenton” suede ankle boots, item A9651. It should be noted that Bond wears the plain-toe version, not the apron-toe “Kenton Pacer” boots. These have five eyelets through open-laced grommets with three sets brass speed hooks above them. J. Crew describes them as “modeled after an old-fashioned work boot but updated with an EVA (fancy talk for a high-tech foam) sole and a soft suede body.” They are finished with a Goodyear welt that allows easy resoling as needed. The boots don’t receive much screen time during this sequence, but a behind-the-scenes shot of Seydoux and Craig reinforces that they are indeed the same J. Crew boots (inset) as he wore earlier with the Matchless jacket. Once again, Bond uses a cognac-colored suede Vega IB333 inside-the-waistband holster for his Walther PPK. He had previously used the same model in Skyfall and a larger version for his Walther P99 in Casino Royale. More information about the Vega holster can be found at James Bond Lifestyle. This would have been a good time to bring back the “farewell to arms” bit from License to Kill if only there was a Hemingway reference in this scene too. The Omega Seamaster 300 SPECTRE Limited Edition, introduced as a tie-in with the release of Spectre in 2015. Much ado was made over 007’s wristwatch in Spectre as Omega rolled out its cross-promotional Omega Seamaster 300 SPECTRE Limited Edition on a NATO strap for the film’s release. The watch, reference 233.32.41.21.01.001, has a stainless steel 41mm case and is powered by the revolutionary and magnetic-resistant Omega Master Co-Axial calibre 8400 movement. The black dial has a broad arrow hour hand and the rare “lollipop” seconds hand as well as a “0” replacing a the “12” on the bezel. The five-striped NATO strap has black and gray stripes with a stainless Omega-branded buckle. 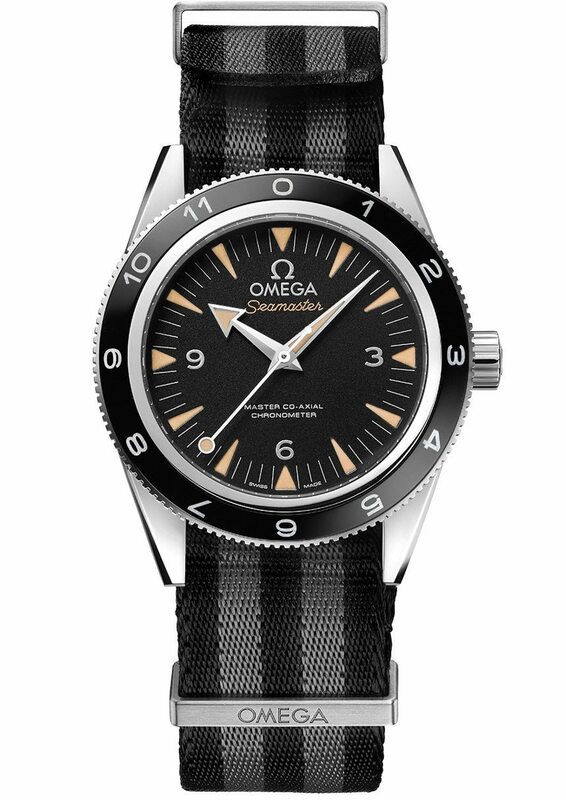 James Bond Lifestyle notes that this was the first time that 007’s actual on-screen watch was marketed to audiences, and it is still featured prominently on the Omega site. Bond wears a pair of Tom Ford Henry Vintage Wayfarer FT0248 sunglasses that, despite their name, are more of a browline style than the traditional “wayfarer”. Available in black, vintage Havana, and dark Havana, Bond wears the “dark Havana” style – color code 52A – with acetate frames, smoke-colored lenses, and gunmetal inserts along the bottom rim and “T”-branded temples. They are still available from the Tom Ford site for $405, although some scavengers may have better luck scouring Amazon. More information is available on James Bond Lifestyle. Bond spies a ’48 Rolls through his Tom Ford shades. For more about this outfit and its accessories, check out James Bond Lifestyle’s portal. Whether it was intentional or not, this Spectre outfit certainly evokes the brown hacking jacket and cavalry twill trousers that Sean Connery wore in Goldfinger while tracking his nemesis through the Austrian countryside. 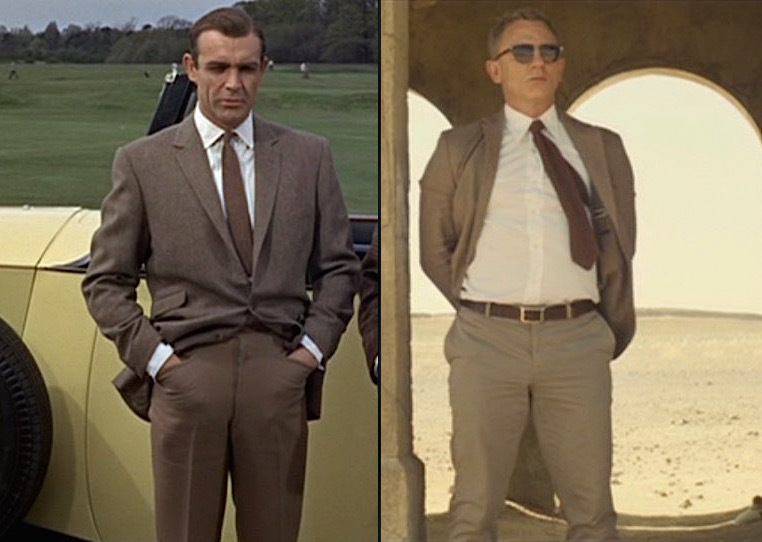 Sean Connery in Goldfinger (1964) and Daniel Craig in Spectre (2015), both sporting brown odd jackets and trousers with white dress shirts, brown knit ties, and – unseen – brown suede boots. Both outfits involve sporty jackets and trousers in slightly differing shades of brown, white shirts, brown knit ties, and brown sueded boots. Both scenes even prominently feature classic Rolls-Royces owned by the villains! James Bond: That is a 1948 Rolls Royce Silver Wraith. …and pack it all in a Globe-Trotter Original brown suitcase like 007 carries in Morocco! Identified by James Bond Lifestyle, the Globe-Trotter “Original” is available in brown with brown corners with traditional vulcanized fiberboard corners like Bond carries as well as a navy version with black corners. James Bond (Daniel Craig) checks his Walther PPK in Spectre (2015). With the help of designers like Brunello Cucinelli and Tom Ford, Bond finds the sartorial intersection of comfort, class, and cool while waiting in the hot Moroccan desert. Iconic Alternatives has a great rundown of affordable options to channel elements of this and many other 007 outfits. This outfit has received plenty of special attention with attractive and well-priced alternatives for the jacket, trousers, belt, tie, and boots. Excellent review! I love all of these on Bond. Excellent post. Spectre, IMO has a weak plot but it does have great clothing styles. Please do the Day of the Dead navy suit next. Especially since the Day of the Dead is coming up end of October. Concur with Nico– the navy DotD suit would be an excellent follow-up and a great tie-in for next month’s festivities! I love James Bond. This Spectre James Bond jacket is so incredible. Really wish Jany would’ve put him in the Swanseas that C&J sent to the production team for this scene. They’re a perfect dark brown wingtip derby that would’ve harkened back to the Connery Era.